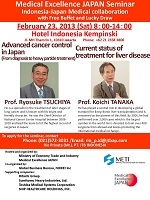 The seminar “Indonesia-Japan Medical Collaboration” will be held by Medical Excellence JAPAN on February 23rd 2013 at Jakarta, Indonesia. The seminar will provide the wide variety of advanced medical treatment in Japan as well as the further collaboration for the mutual growth in medicine of both countries. To apply this seminar, please click here for more details. Eriya Kitano, Director of Emergency Assistance Japan Co., Ltd. was interviewed by Halo Jepang regarding the upcoming seminar in Jakarta. We are looking forward to welcome you at the seminar.